I learned a Greek word last week in Bible study: prosdechomai. Now that I am not working but anticipating heading back to school in January, I started attending this wonderful gathering of women on Thursdays at church with my sister Jana, who has been going for over twenty years. There is always a delicious spread of food to feed our bodies even as our souls are fed on the word. This is an experienced group of Bible students and they are being led by three gifted teachers this year who are all friends of mine. Lou and Jackie and Jessica have taken us through 2 Peter, 1 and 2 John, and this past week, 3 John. Lou took us through this short but meaty epistle where we met three men known by John and actually named: Gaius, Diotrephes and Demetrius. The word – prosdechomai – was associated with something Diotrephes was not doing. He was not welcoming, not receiving, early missionaries into his home as they traveled with the good news. Indeed, he was even putting people out of the church who did open their homes. We had a good discussion about hospitality in the church, especially as it pertained to those who come to our church from other places to tell the stories of how God is working in this world. In a large church of 750, we have a hard time getting 25 to come to a lunch to hear what they have to say. We chewed on that a bit. And John says in verse 11: “Beloved, do not imitate what is evil but imitate what is good.” Don’t be like Diotrephes! As I first heard from Lou, and was reiterated through Derek who was using a Ken Bailey book (The Cross & The Prodigal) to guide his sermon, the Greek word dechomai means to receive. With the prefix pros- added to it, the meaning becomes deeper: to welcome into fellowship. So here is what causes the grumbling from the righteous: that Jesus would not only welcome the unrighteous (me and all the rest) for conversation, but that he would go even further and eat with them. He would fellowship with them. And, of course, we know this from coming to the Lord’s table for the Lord’s supper in communion. This group of unrighteous, undeserving sinners – we the people – are invited to sup with the Lord God almighty. It is an amazing thing. God invites to his table in fellowship those whose sins have nailed him to the tree. His enemies. Us. Grace at the table of the Lord. And as I walked yesterday and the day before thinking about this word – prosdechomai – a picture from 2010 came to my head and my heart. August, 2010, Aleppo, Syria (before the war) – Nine women had traveled to Lebanon and Syria on a trip to meet and learn about our brothers and sisters in the National Evangelical Synod of Syria and Lebanon. We worshiped with Middle Eastern Christians. We laughed with them. We baked in the sun with them. We had our minds and our hearts and our world expanded by this family connection we now had experienced. While in Aleppo for three days with the church there, we had the humbling opportunity to visit in the homes of Iraqi refugees who were being cared for by the Aleppo church as they waited for new homes in other parts of the world. 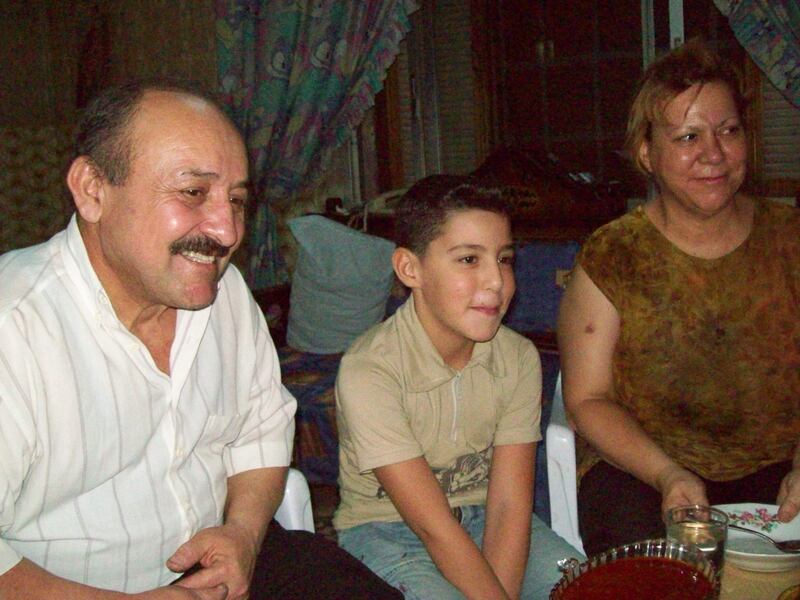 Why were there Iraqi refugees in Syria? Because the U.S. government had invaded their homeland in 2003. Faulty intelligence that said Iraq was responsible for harboring Osama bin Laden, a friend of Saddam after all, right? Faulty intelligence about weapons of mass destruction. Faulty, faulty, faulty. And Iraqi families paid a heavy price. They were in Syria, chased out of their homes in Iraq because we had unleashed Armageddon on them. And so they sought refuge, and they found it in Syria. And so it came to pass that nine American women were invited into the homes of three Iraqi families. Three families with nothing. Scare furnishings in their homes, donated by Aleppo church families. They were surviving on what was left of the savings they ran from Iraq with, much like what is happening today in Syria and Iraq. My group of Betty and Sue and me was prosdechomai-d by the Aziz family. And there we sat – sumptuous meal in front of us, tea and coffee and sweets – with people driven out of their homes by the actions of our government, the actions of we the people. Grace at the table. Prosdechomai. That night in Baghdad, I read Psalm 23. It’s the one folks usually read at funerals: “Though I walk through the valley of the shadow of death.” And I felt like I was. But I noticed something I have never noticed before. The psalm says that a table is prepared “in the presence of my enemies.” I remember thinking, why are our enemies there? What if after we die, God brings our enemies to the table and asks how we treated them? What if Jesus asks them, “Shane here claims to follow me. Did he love you? Did he feed you and pray for you like I taught him to?” What would our enemies say? The story of the two sons and the loving father told in Luke 15 ends in an open manner. The father has killed the fattened calf for his younger son who earlier in the parable wished his father dead. And now he calls the older son, who in his righteousness also wishes his father dead, to come to the table. Is this not a setting of table in the presence of his enemies? Two brothers, both sinners, both wanting their father dead. But there is the father desiring to prosdechomai with both. And so in a week of learning about prosdechomai from the word of the God I love, I believe, I humbly and haltingly try to follow, I thought of the Aziz family. I thought of how they welcomed enemies to the table and ate with us. And I pray that we will do the same.